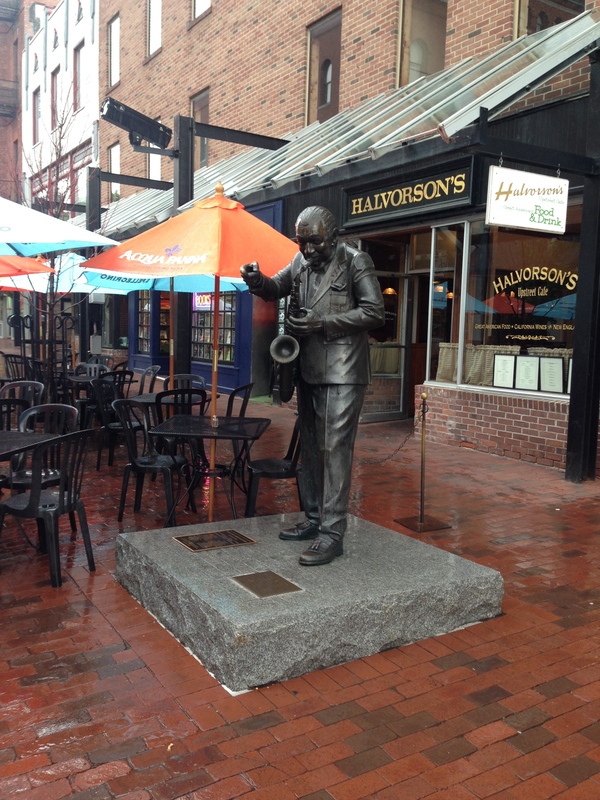 A statue of Big Joe Burrell, a Vermont music icon, stands guard outside Halvorson’s on Church Street in downtown Burlington, VT.
At the end of 6/21/88, Page comments that the band will be playing at Halvorson’s that Friday. It’s interesting to me that Phish only played Halvorson’s one time. Halvorson’s has always been a pillar of the Burlington music community since the 1970s. Every week, Big Joe Burrell and the Unknown Blues Band would play in the courtyard to the delight of Vermonters. This is important to note because there are probably two local bands that were the biggest influence on Phish. The more obvious one is the Sneakers Jazz Band. Every Tuesday, Sneakers, a small restaurant in Winooski, around the corner from the band’s house, had their house band play. In 1998, Trey recalled to local music ‘zine Big Heavy World strolling over and spending the evening. listening to some of Vermont’s finest players. The horns of the Sneakers Jazz Band would go on to form the Giant Country Horns in 1991. But Big Joe and the Unknown Blues Band were just as important. Big Joe’s rhythm section consisted of two guys names Tony Markellis and Russ Lawton, who would in turn form Trey’s solo band’s rhythm section. The original incarnation of Trey’s solo band really was a veritable Vermont all-star band with the Unknown Blues Band’s rhythm section and the Sneakers Jazz Band horn section coming together and viperHouse’s Ray Paczkowski on keys. Adding another angle to this importance, the guitarist for both bands is Paul Asbell, who also gave guitar lessons to Trey. Clearly two very important influences, so much so they both ended up in the liner notes for A Live One. Halvorson’s also is of note for hosting a weekly gig for Grace Potter before she became a national recording artist. So the fact that the band only played Halvorson’s once is a curious stat but nonetheless, the venue still left its mark on the band. Different than the usual bars, Halvorson’s was always known as a more upscale bar and restaurant in town with a more laid-back vibe. Maybe that’s why they weren’t booked there often. As for the show, we only have part of a recording. Also, according to the notes, most of it may not be from this show. I do believe at least the “Lizards” and “Possum” were recorded at Halvorson’s. “Blue Bossa” appears to be from a later gig but would make sense to be played at this venue. The short “Sneakin’ Sally” would also fit as it keep tighter than other versions around this time. Worth a quick listen to bridge the gap but not noteworthy musically. I was at this show. Jon’s kick drum pedal broke. Maybe was even playing a toy kit. Here is the flyer from the show from my collection.